If you are interested in applying for several credit cards to accrue many sign-up bonuses, this is a guide for the things you should do to prepare for your application spree (or App-O-Rama). Your ability to get approved for credit products will be directly related to your credit score. The most important thing is creating a card application list. Can you actually use the rewards relatively immediately? This series talks about how to go on an application spree (App-O-Rama) to accrue a whole lot of great sign-up bonuses in one shot. In the previous article in this series I talked about the credit score. Since we are focusing on credit cards here, your credit score is going to be the most important thing in determining how profitable your application spree is going to be. The first thing will be timing. In the previous article, I commented on how the inquiries on your credit report from each application will likely temporarily reduce your score. Your score will likely recover and potentially be better after a few months. First, you will want to make sure that your credit score is at its highest prior to starting your application spree. 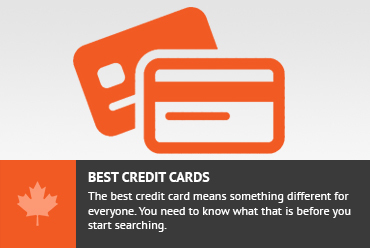 It is probably a good idea to wait a few months after you have recently applied for credit before you apply for a whole host of cards. Remember, one of the key reasons for doing this in a single shot is that you want to make sure that each of the applications looks at your credit score while it is at its highest. Another implication of this timing is that you are going to want to make sure that you don’t have any upcoming credit applications soon after your App-O-Rama. If you are expecting to be putting in a mortgage application or buying insurance a month or 2 after your App-O-Rama, you would be better off waiting. If you find an error (statisticians say there are errors in between 10% and 33% of all credit reports), you can dispute it. You can file a dispute online if you find an issue. Dispute forms are available for Equifax and Transunion. You will get a credit score in the range of 400 – 900. Most people are probably in the 600+ range. If you have over 750, you are likely going to get any card you apply for. The Globe and Mail did a discussion on this here. Once you have set yourself up for your application spree, you need to make sure that you are ready for the organizational exercise that is an App-O-Rama. Primarily, you need to make sure you have your financial affairs in order. You will want to make sure you already have some sort of system for monitoring your inflow and outflow in your credit cards and bank accounts. This is really just to make sure that you are not complicating an already messy financial life (i.e. if you can’t manage 2 credit cards you are better off not trying to manage 5). This should really be the system you normally have for monitoring how much you owe. If you can answer me how much your last payment was and how much is outstanding on each of your credit cards (as you should be able to) then you should have this covered. If you are applying to a bunch of credit cards for their sign-up benefits, you are likely going to have to have some sort of minimum spending requirement on each of the cards. Some cards will require you to spend $1000 in 3 months to get your bonus. Others will give it to you after your first purchase. You will want to have a plan for how to get all of those minimum spending requirements in the appropriate time frame. Million Mile Secrets has a list of 40 ways to complete your spending requirements. Most are applicable to Canadians. Something else to be aware of is managing when you expect your bonus to be paid out. You will want to have some sort of a system for making sure you actually get your bonus paid out. I think a simple Google Calendar entry for a week after your bonus should be paid out should suffice as a reminder to check on it. It would be a terrible thing to go to all this effort if you didn’t actually get the bonus because it got lost in the system somehow. Is this actually a useful card to carry? Do you get 5K points bonus, but need 15K points to redeem? For each card, I give a subjective App-O-Rama “score” which puts these pieces into a numerical value, then apply for the best one from each issuer. In December 2013, here is my list of cards that I would be interested in putting in my App-O-Rama. 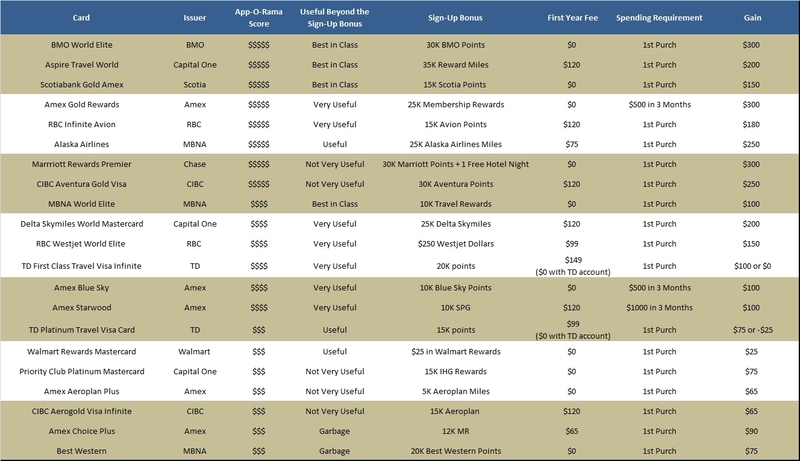 See the image below the table for more details, including the first year annual fee and the usefulness of each card. I have ranked these based on what I prefer, but you can take your pick on what it is that you value. I would suggest putting the cards you want the most at the top of your list. Noteworthy is that platinum card benefits might be so great that sign-up bonuses will allow you to access those benefits for cheap, instead of putting money in your pocket. As a result, I have separated those into a different table. Now that you have your list in the right order, you will want to actually apply for the cards by clicking on the appropriate apply link below and giving them your information. As you probably know, you are likely to get a response immediately. Depending on your credit score and the cards you are applying for, you are likely to get approved for many of your cards. Now, you just have to wait for the cards to come in the mail. For some of your card applications, you might get the dreaded “we require more time to review your application” line. If this is the case, you simply have to wait until a human being reviews your application and says either yes or no. Usually you will get a response in the mail, but you can usually call the company after a week or so if you are impatient. I would strongly suggest that your reason for applying for the new card should not reference the sign-up bonus. Hopefully you will get approved for the card. Now that you have your cards, you simply have to follow through with your spending plan and monitor your inflow and outflow on each card until you get your bonus. Enjoy the free money. Making a card list The most important thing is creating a card application list.